Two sheep which escaped from their home in the town of Mystic, Connecticut are currently serving time at a nearby correctional facility -- though they seem to be enjoying their new accomodations. According to WTNH Channel 8, the two animals got loose after the fence on the property they lived on blew down in a storm. During their brief stint on the lam, the sheep became separated as they wandered through town, which only added to their franticness. Fortunately, local Animal Control Officer Donna Dusa was able to wrangle them both before they got themselves into any serious trouble. "They were so happy to see each other," says Duso. 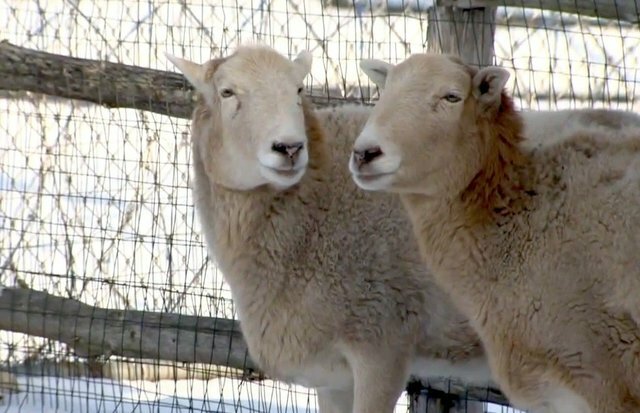 Until a more suitable home can be found for them, the two sheep were sent to a secure, yet comfortable, enclosure at the Corrigan-Radgowski Correctional Center -- home to several other livestock animals -- where they are reportedly "being spoiled" with plenty of grass and hay.